:There is little in life that rocks us like the death of a husband or wife. Whether you're feeling alone, drowning under an ocean of emotions, or you've worked your way through to the darkest nights of the soul and are now wondering how to get on with your life, you'll find comfort and guidance from the authors of this book. One a clinical psychologist, the other a pastor and professor, both suffered the loss of a spouse at a relatively young age. Their empathy, valuable psychological insights, biblical observations, and male and female perspectives will help you experience your grief in the healthiest and most complete way so that you can move forward to embrace the new life that is waiting for you on the other side. 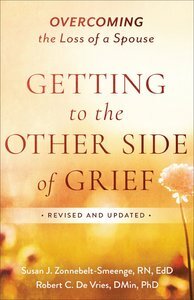 About "Getting to the Other Side of Grief: Overcoming the Loss of a Spouse"
Susan J. Zonnebelt-Smeenge (R.N., Ed.D.) is a clinical psychologist at Pine Rest Christian Mental Health Services. Robert C. De Vries (D.Min, Ph.D.) is professor of church education at Calvin Theological Seminary. They live in Grand Rapids, Michigan. De Vries is professor of church education at Calvin Theological Seminary and regularly conducts workshops and seminars on issues relating to adult education, youth ministry, and bereavement.